Christmas by tradition is Red and green but times have been a changing and the modern Christmas can be almost any theme or colour. The traditional Christmas Angel atop the tree has flown her wings in many houses and now flowers/butterflies and bows can be seen, even the Eiffel tower is not amiss on top of a tree. There seems to be no right or wrong. 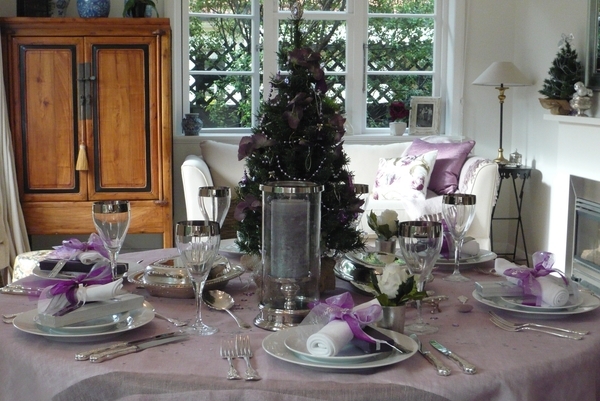 So, with this in mind my Christmas table follows my Purple/Mauve and silver theme and my Christmas tree has sprigs of mauve hydrangea amongst its decorations. 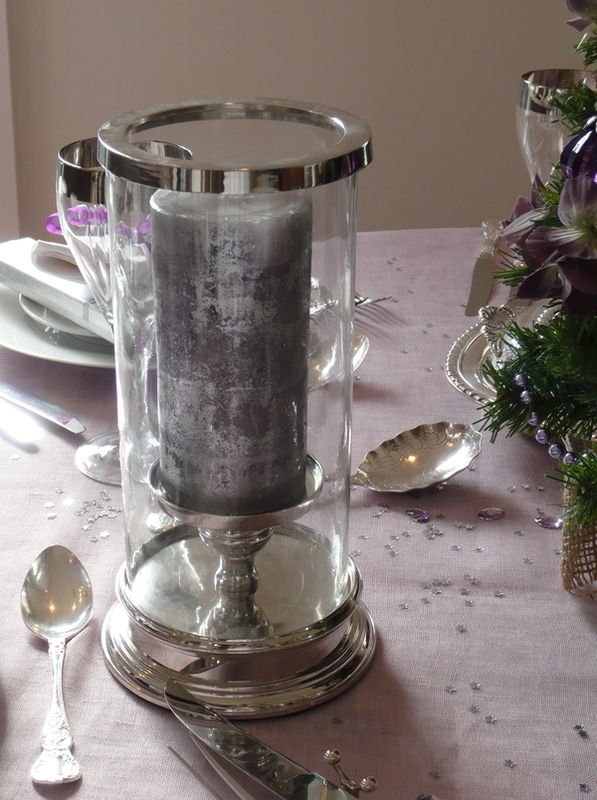 I used vintage silver cutlery and serving ware and combined with some gorgeous Laura Ashley glasses and two beautiful hurricane lamps, also from Laura Ashley. A simple setting for six. 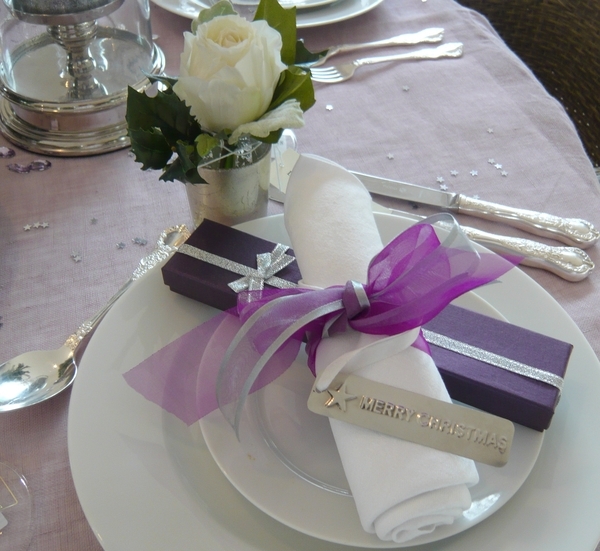 I used little silver stars and some mauve crystals to decorate the table. The small tree was from the Christmas Heirloom Company and decorated by myself. The little purple & silver boxes will hold some Rocky Road Bark for my guests. 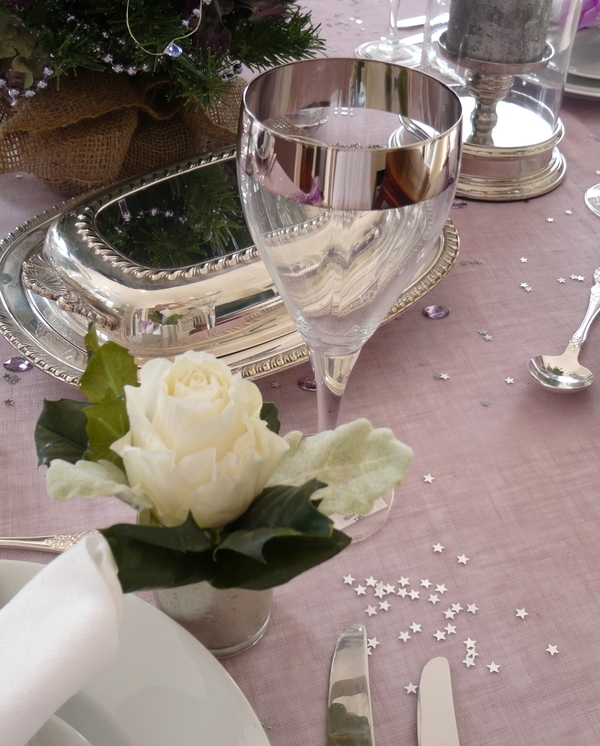 I love the fine gauzy linen tablecloth, purchased from a little shop in St Heliers called "Distinctive Linens." 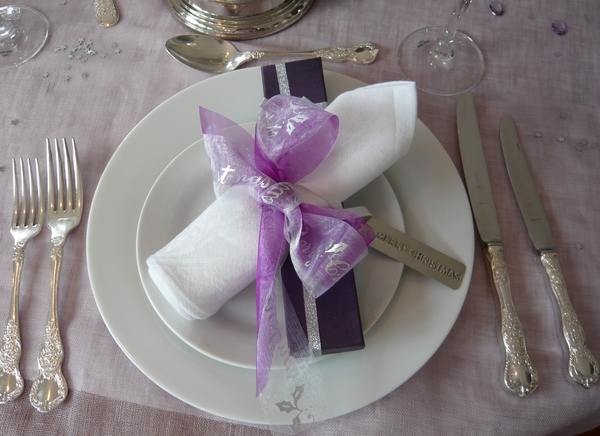 Instead of using serviette rings I used two organza ribbons and tied a bow to soften the look of the table. 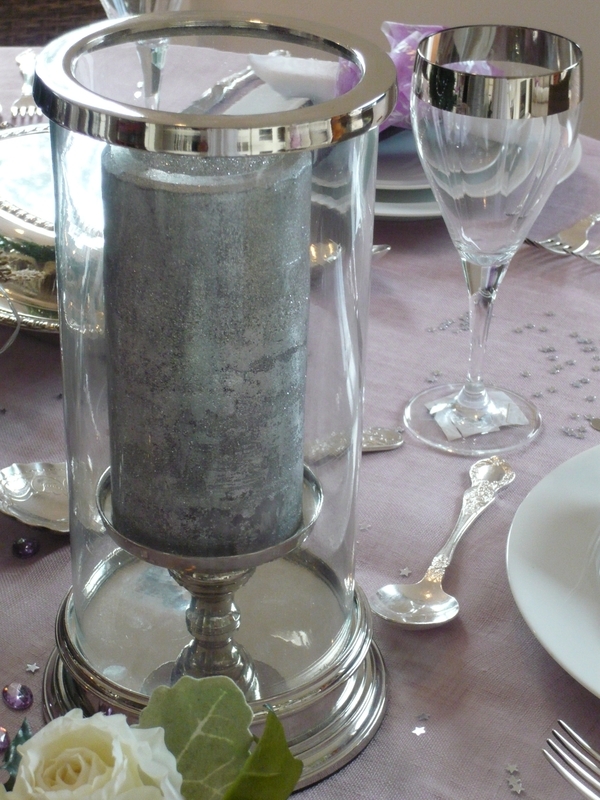 Silver and glass hurricane lamp from Laura Ashley - NZD179.00. A classic looking piece, silver is fast becoming popular again. The other pieces of silver on my table are pieces passed down through our family. 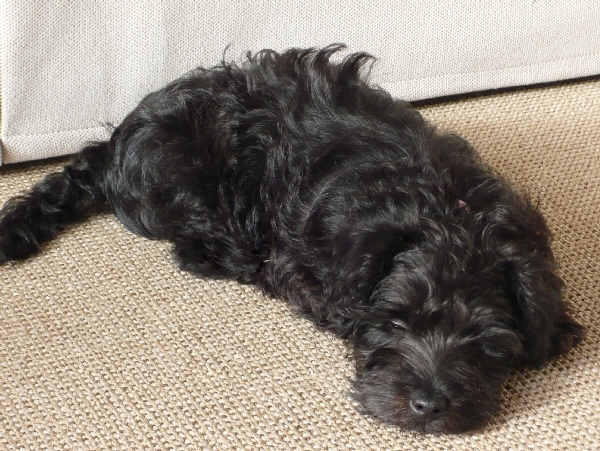 Zzzzz...says Poppy who was quite put out by the lack of attention during the photo shoot. for your own Christmas table setting. What a gorgeous table! Love the purple & silver - very unexpected. Moving away from the red and green too! Following along. 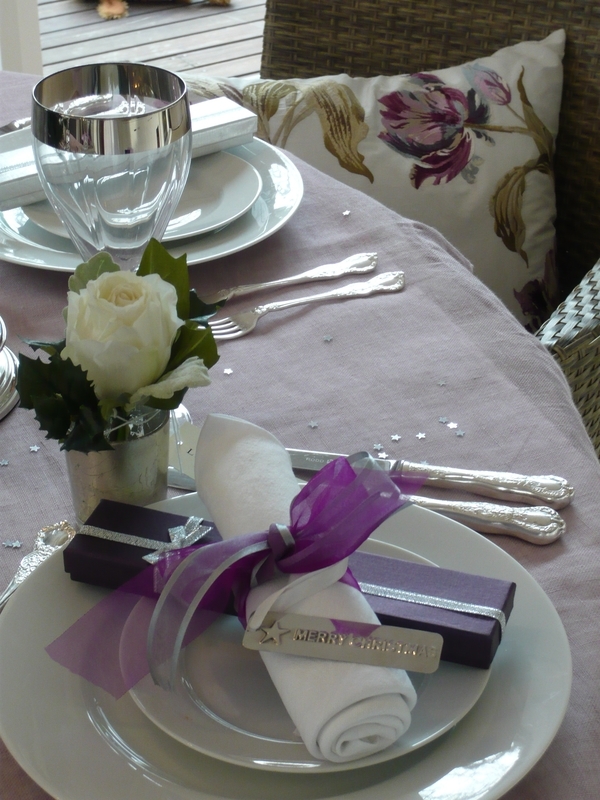 Your Tablescape is gorgeous with the purple and silver sweet lady. I also love your little tree for a centerpiece with the same colors. You did a Beautiful job putting this all together great job. You also have a Beautiful Home. I would like to thank you so much for your sweet comments on my Christmas in the park so sweet of you. I'm your newest follower on your blog now. I hope you and your family have a wonderful Christmas. I post ever Monday so please come back and see me. What a beautiful table setting. Love the colours! Beautiful table! Love the different colors! I like just about anything as long as it's pretty or fun! I do love your gauzy tablecloth...love textures! Your pretty boxes and floral accents are very lovely! Great job! Hi, Lee! This is my first visit to your blog via Susan's Tablescape Thursday. The colors you have chosen are magnificent! I think we tend to shy away from non-traditional colors for Christmas because we're afraid of how they'll be perceived, but you have definitely demonstrated here how lovely and germane to the season the bold gemstone purple can be. 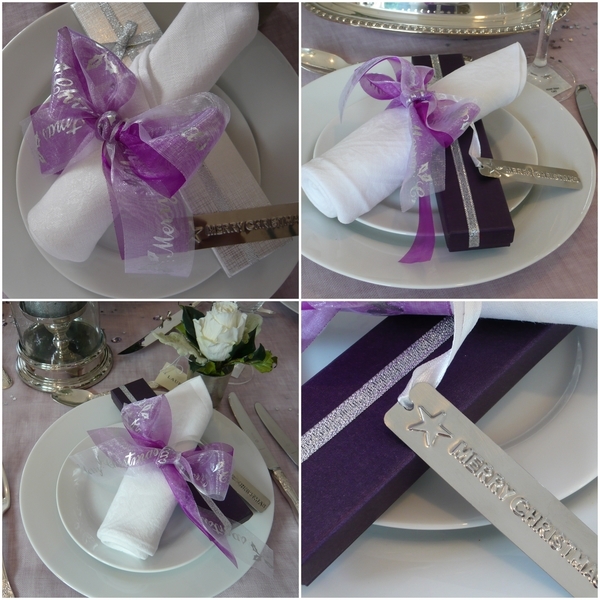 Softened with the lilac and paired with the always-perfect silver, it's a hit! The Laura Ashley stems have to be my favorite with that incredibly wide band. Those kind of stone-washed looking fat candles are great, too. Perfect for your table! I hope you are enjoying this Christmas season. Have a good weekend! Thank you Liz and Alycia for your lovely comments. 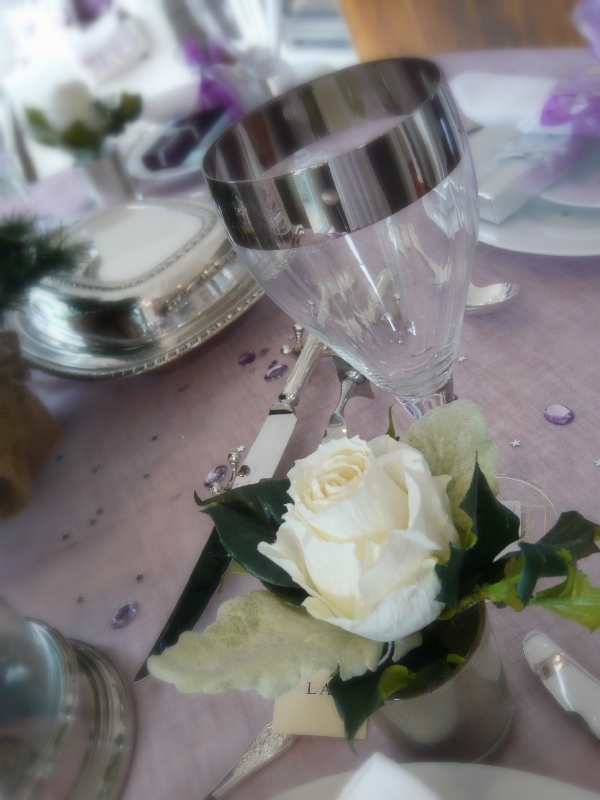 I agree the Laura Ashley stems are gorgeous, they have lovely fluting in them which are not so noticeable in the photos but really add a lovely sparkle to them. So pleased you found my blog and hope you visit again. 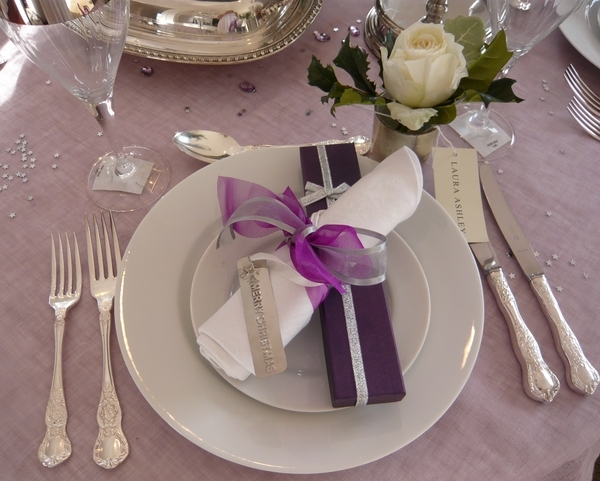 Hello Lee, I can see that you are are genuinely passionate about doing this table setting! I am really impressed about your creativity and I appreciate the effort you have put in making this post readable by us! Thumbs up! P.S. Your dog is also cute. Please extend my hug to your pup! 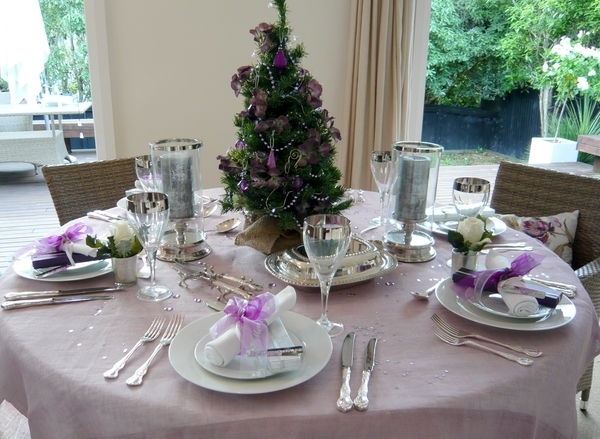 Your table setting is gorgeous and I love the Christmas table decorations and the color theme. We're planning to have a white christmas this year. I wish you a very happy Christmas.